As a descendant of a number of orthodox Rabbis I received a strict rabbinical education. I thank God for a mind which enabled me at the age of seventeen years to obtain the highest diplomas of two Rabbinical Seminaries. These distinctions, however, did not satisfy me and I continued earnestly to study the Talmud, the Shulchan Aruch and other rabbinical works. When I was 20 years old I knew much of the Talmud and other commentaries on the Old Testament by heart. On account of my thorough knowledge of those books many Rabbis used to consult me concerning Kashrut questions, and in spite of my youth they accepted my decisions as correct. At the age of twenty-five I became Rabbi at Dubno in Poland. I was strictly orthodox and rejected every opinion that did not comply with the letter of Talmudic traditions. Two years later I had a call to Lodz, a large town in Poland. There I held not only the position of a Rabbi, but became also a Professor at the Rabbinical Seminary. In my lectures I admonished the students to abhor Christianity and Jesus Himself. I believed all the terrible stories about Jesus as contained in the Talmud. Through God's wise foresight, however, I became acquainted at that time with swell educated Missionary. He knew the Talmud and began to converse with me. What he told me was very interesting so that I paid him frequent visits. Very soon my relatives got to know about this and became very perturbed. They discussed the matter and then decided to write, without my knowledge, to the Chief Rabbi of Palestine, T. Cook. Rabbi Cook knew my name through our Kashrut correspondence. He was told of "the great danger which threatened my soul", because of my association with a Christian Missionary. They implored him to have pity on my soul and to save me from "the great danger" by extending to me a call to Palestine and obtaining for me a permit to enter the land. They were convinced that in that way I would be "quickly delivered from the bad influence of the dangerous Missionary." During all that time I had not the slightest idea of what was going on. A few weeks later I received a letter from the Chief Rabbi. He wrote about various things and mentioned quite casually that he could get me a permit to enter Palestine should I wish to come there. I was delighted at the prospect of going to the land of my forefathers, and accepted his suggestion joyfully. A month later I went to Palestine. Shortly after my arrival the Chief Rabbi appointed me as Secretary to the Chief Rabbinate of Jerusalem. Moreover he continually showed me his special favour and liked to have me near him. His interest in me became so obvious that I began to wonder what might be the reason. One day I frankly asked him about this. Then he told me of the correspondence with my relatives and tried to convince me of the "falseness" of the Missionary's teachings. Here I must confess that the Missionary's words had penetrated only my mind and not my heart. Sometimes the truth takes many years to proceed from the head into the heart, and so it was in my case. In consequence of the Chief Rabbi's talks I began to think that he might be right, and gradually the Missionary's conversations with me faded from my mind. After the death of Rabbi Cook I accepted a call as Talmud teacher at the Rabbinical Seminary of Tel Aviv where I taught for two years. Yet the Lord sought me! One day I travelled in the company of several members of my Committee by train from Haifa to Jerusalem. Opposite me in our compartment there sat a young man reading in a little book. On the cover I could see very clearly the words "New Testament" in Hebrew. At once I knew that he was a Jewish Christian, Jewish because he read Hebrew and Christian because he read the New Testament. In the presence of the members of my Committee I felt obliged to protest to the young man and to reproach him for reading such a strictly forbidden book as the New Testament. I criticized him severely and in that way made known my position as Rabbi. To my surprise the young man did not get annoyed but smiled at me and said: "Perhaps you will show me what you find offensive in the book and I will try to explain it." When he had said that my thoughts suddenly went back over the years to the time when I had read a little in the New Testament though it had been only superficially without reaching my heart. Nevertheless, I knew there was nothing repugnant in the book. What annoyed me most at that moment was the presence of my fellow travellers. I had to give the young man a suitable reply so as not to lose my friends' respect. That was why I said to him: "How can I show you wrong statements in a book which we are forbidden to read?!" He answered: "How can you criticize and judge something of which you have no knowledge? First read the book please, and then you will see that there is nothing whatsoever in it that could be criticized." I remained silent, for what could I have said? Was I not well aware in my heart and soul that there was not a single word in the New Testament which could be criticized or condemned? Suddenly my discussions with the Missionary in Poland came back to my mind. Why had I run away from his instructions which I had respected so much? Like lightning these thoughts moved within my soul. Obviously the young man noticed the confused expression in my eyes. He whispered to me: "I see you are interested in these things. May I give you this New Testament? Please take it; I have another one at home. Your companions do not see it; just now they, are looking out of the window admiring the fields". Quickly I took the little book and put it in my pocket. That same evening I began reading the New Testament in my room at Jerusalem. Before opening it, however, I had prayed: "Open thou mine eyes, that I may behold wondrous things out of thy law" (Psalm 119:18). In His grace the Lord heard my prayer and showed me things which I had never seen before. While reading I felt the creation of a clean heart and of a right spirit within me (Ps. 51:10) and there was new light (Ps. 119:105). Like a thirsty man drinks greedily when he has found a spring of fresh, cool water, so I drank in page after page of the New Testament. In one long draught I read the Gospels of Matthew, Mark and Luke until I noticed the clock 3 a.m.! 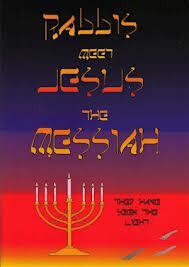 With every page there grew and deepened the conviction that Jesus Christ is the Messiah prophesied to us Jews. Slowly but surely my burdened heart, soul and spirit became free and joyful. This was an entirely new and strange feeling for which I could find no name at the time. I could not have described it; yet, it was so real. Certain chapters of the Holy Scriptures attracted me in a special way and I can recollect still many of them. The Sermon on the Mount opened up before me a new world, a world full of beauty and glory. The Proclaimer of such a lovely world cannot be evil whatever the Talmud says. The words, "Heaven and earth shall pass away, but my words shall not pass away" could have been spoken only by God Himself or by a madman. And from the answers that Jesus gave the Scribes and Pharisees it is abundantly clear that He was not a lunatic but, on the contrary, exceptionally wise. Therefore it cannot be otherwise but fact that He was truly God, as also His disciples maintained (John 20:28). I was deeply impressed also by Luke 23:34, "Then said Jesus, Father, forgive them; for they know not what they do." Compare this utterance with that of Jeremiah when he was oppressed. Jeremiah was enraged and cursed his persecutors. Jesus, on the other hand, even when nailed to the Cross, had nothing but forgiveness, mercy, sympathy and prayer for His persecutors. What a difference! How much greater was He than the prophets were! My soul was so touched by what I had read that, although it was three o'clock in the morning, for the first time in my life I knelt down and prayed; for we Jews pray standing and not kneeling. I cannot say how long I prayed but I know that never before had I prayed with such fervour and purpose. I wept and implored God for light. I beseeched Him to show me the truth: what was right and what was wrong, the Talmud or the New Testament. And for the first time I prayed in the Name of JESUS! After that prayer there came into my heart such peace and joy as I had never experienced before, not even on the Day of Atonement although on that day I always fasted and prayed fervently. Never before I have such certainty of reconciliation with God as I felt then and as, thank God, it remained with me ever since. I knew and had no doubt whatever that the Lord Jesus is the long prophesied Messiah of the Jews and the Saviour of the world, and I came to see in Him my personal Redeemer. Then I went to bed; but after this vivid experience I was unable to sleep. Soon I heard a voice say to me: "Never again wander away from Me! I will use you for the glory of My name and as a witness to My saving grace." This was no imagination but fact, and immediately I answered: "Lord, here am I." From then onward my life no longer belonged to me but to Him and so it is still. For in that solemn moment I surrendered myself completely and unreservedly to Him. Even that, I felt, was little enough as repayment for all He had done for me when He saved my soul from eternal damnation. Alas, at first I was no more than a secret believer. In my inward being I knew that the Lord Jesus Christ was the Messiah of Israel and my personal Redeemer but continued nevertheless to fulfil my tasks and duties as Rabbi. Two months I lived like this. But oh! how depressed and miserable was my soul. At last I realized that I could no longer lead a double life and no longer serve God and mammon (Matth. 6:24). I had to confess Christ publicly whatever the consequences might be. The same day I resigned as Rabbi. The Committee Members were dismayed. They asked me earnestly not to leave and offered me a higher stipend. Then I witnessed to them frankly of the Messiahship of Jesus telling them that He is the long expected Messiah and my personal Redeemer. Immediately persecutions followed but they did not intimidate me in anyway. I had expected persecution. I was stoned on the street and had to stay in bed for some time while the doctor came twice a day to attend to and bandage my wounds. When my fellow Jews saw that persecution did not move me they tried another plan: A prominent Jewish man offered to adopt me as his son and heir provided I would renounce Christianity. I told him: "If you can give me peace for my soul, procure me the presence of God and pardon for my sins, I will return to Judaism." He answered: "That I cannot do for I do not possess myself what you are asking." He never approached me again. Later, when I was in such danger that I did not know where to turn, I met an American Missionary in a Bible shop. He talked to me in Hebrew and when he heard that I was converted and in danger of my life, he advised me to leave immediately for Beirut in Syria and gave me a letter of introduction to the Pastor of the Evangelical Church there. I went and two months later was baptized. Shortly thereafter I entered a Bible School and after passing the examinations returned to Palestine in order to work amongst my own people witnessing to them of Jesus Christ. My method of work was twofold: First I showed from passages in the Old Testament that the Lord Jesus is the true and long predicted Messiah of Israel. I have found more than 200 passages which prove this fact beyond any doubt. Then, secondly, I showed the superiority of the New Testament teachings to those of the Talmud. God's blessing rested on this method, and a number of my brethren to whom I have witnessed have come to believe in the Lord Jesus Christ as their Redeemer. Read Another Testimony. See how God is working in the lives of others. Messianic Good News has graciously allowed this testimony published on its web site to be shared with others. This testimony is the shortened version of the actual testimony published in the book "Rabbis Meet Jesus The Messiah." This book contains 20 testimonies from Rabbis who have put their faith in the Jewish Messiah Jesus and is an encouraging read. To order a copy of this book please contact Messianic Good News, P.O. Box 607, Wading River NY 11792-0607 or email mgnusa@optonline.net. Their web site can be found at messianicgoodnews.org.